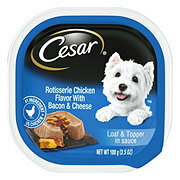 Breakfast is the most important meal of the day, and dogs love it, too! 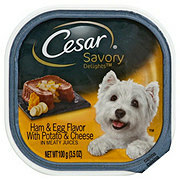 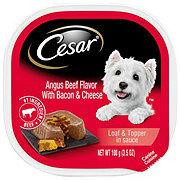 Wake your dog to a tantalizing delight with CESAR SUNRISE Breakfast Grilled Steak and Eggs Flavor pate in meaty juices. 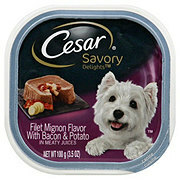 Fortified with vitamins and minerals, our savory breakfast dog food gives your pampered pooch a meal just like yours — with complete and balanced nutrition made just for them. Served in convenient trays with no-fuss, peel-away freshness seals, the CESAR Brand makes mealtime easy at any time of day. 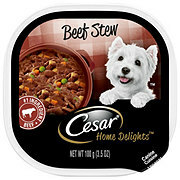 Plus, our gourmet wet dog food uses ingredients formulated to meet nutritional levels established by the AAFCO dog food nutrient profiles for maintenance. 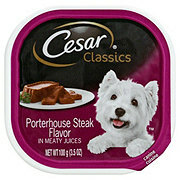 Ingredients Sufficient Water for Processing, Beef By-Products, Animal Liver, Meat By-Products, Beef, Chicken, Poultry By-Products, Calcium Carbonate, Sodium Tripolyphosphate, Added Color, Carrageenan, Potassium Chloride, Xanthan Gum, Magnesium Proteinate, Grilled Steak Flavor, Dried Yam, Natural Flavor, Salt, Erythorbic Acid, Egg Product, Guar Gum, Zinc Sulfate, Vitamin E Supplement, Sodium Nitrite (for Color Retention), Monocalcium Phosphate, Copper Sulphate, D-Calcium Pantothenate, Thiamine Mononitrate (Vitamin B1), Vitamin A Supplement, Vitamin D3 Supplement.